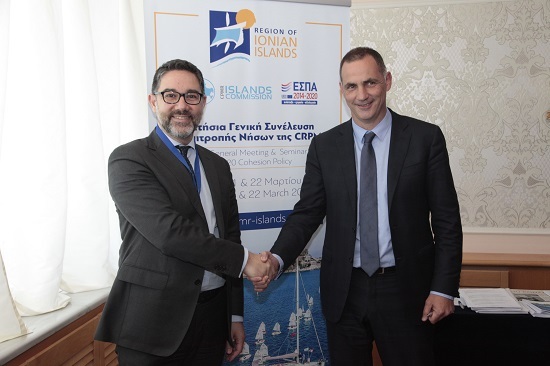 The Conference of Peripheral Maritime Regions (CPMR) and its Islands Commission (IC) have announced a crucial new collaboration with Greening the Islands (GTI) that will boost co-operation between businesses and island governments to enhance the sustainability of European islands. At the Islands Commission’s General Assembly in Corfu, on 21-22 March, the CPMR, the IC and innovative global initiative Greening the Islands signed a Memorandum of Understanding (MoU) outlining their plans to raise awareness about the need to effectively and rapidly tackle the sustainable development challenges faced by islands. Gianni Chianetta, scientific director of Greening the Islands, said: “The key to unlocking that potential is co-operation between all the key stakeholders and finding win-win solutions for island administrations, local populations and business. This agreement seals an axis between island governments and the business community that is indispensable for the real transition to sustainability”.